MANDELA: LONG WALK TO FREEDOM is a film in that long tradition of sepia toned Hollywood hagiography that fully subscribes to the Great Man theory of history. It is a simple film that tells a powerful story and contains a truly exceptional central performance. But it is mortally wounded by bad make-up and intellectual timidity. So, I guess we all know the story. Nelson Mandela is a lawyer in apartheid South Africa - an advocate for the repressed in white courts. At first reluctant, he becomes a leader in the African National Congress - a banned political party campaigning for equal rights. When the struggle goes nowhere, they turn to violence and Mandela goes underground. When a sabotage mission goes wrong he's caught, tries to become a martyr, but is instead imprisoned for life on Robben Island. There he stayed for decades as international pressure increased, the ANC's violence increased, and F W DeKlerk realised he would have to negotiate. All this led us to that iconic image of Mandela walking free, hand-in-hand with his long-supportive wife Winnie. The crucial final act, is seeing the man who could so easily seek vengeance, pleading for what would become "truth and reconciliation". The problem with this film is that while it tries to make us see the nasty side of Mandela - his serial womanising - it doesn't want to go too far in damaging the legend. Similarly, it treats Winnie Mandela - a fascinating figure - with respect and sympathy - which is right - but arguably goes too far. We see her brutalised and radicalised - but we don't see enough of the ANC campaign of violence that so alienated her from Nelson. Indeed, I wanted much more of Winnie, not least because while Idris Elba's acting was just fine as Nelson, Naomie Harris absolutely mastered the accent and growing hardness of Winnie. It is absurd to me that Elba is getting award nominations while Harris is unrecognised. 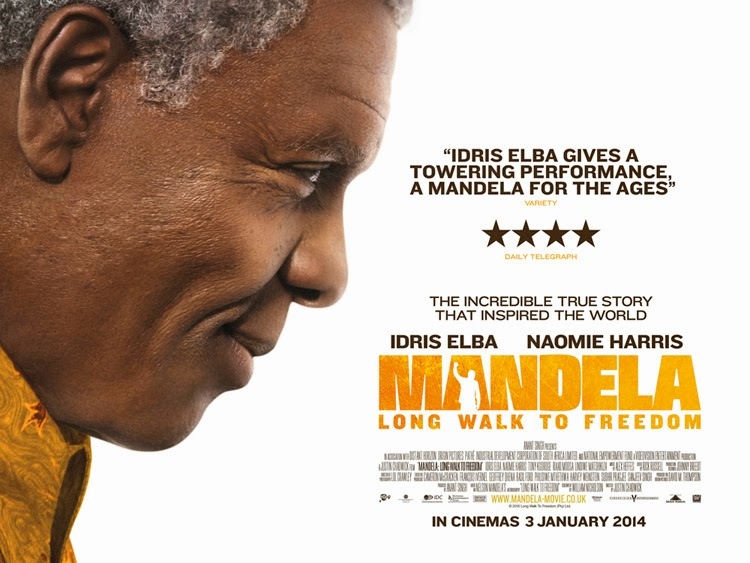 Of course, at a much more superficial level, the real problem of this film is that Elba looks nothing like Mandela. That doesn't matter of itself. I saw Mark Rylance play Cleopatra and his acting was mesmerising. And maybe if they'd been less heavyhanded with the make-up and just let Elba act Nelson rather than trying to make him look like Nelson, it would've been less distracting. As it is, the make-up is utterly unsuccessful and utterly distracting. So, overall, a rather disappointing film, worth watching only for Naomie Harris, and to see just how far Mandela's conditions eased in the final years of his captivity. There is no real depiction of the horror of living in a small cell for decades. No searing indictment of that captivity in the manner of Steve McQueen's HUNGER. And no real desire to stir up the pot of controversy surrounding the ANC's tactics, as embodied in Winnie. It's a picture book movie of fortuitous timing and poor make-up. Mandela deserves better. MANDELA: LONG WALK TO FREEDOM played Toronto 2013 and opened last year in South Africa, the USA, Iceland, Portugal, Belgium, France, Israel, the Netherlands, Canada and Kuwait. It opened earlier this year in the UK and Ireland. It opens in Spain on January 17th; in Denmark on January 23rd; in India on January 24th; in Germany and New Zealand on January 30th; in Australia on February 6th; in Sweden on February 7th; in Finland on February 14th; and Singapore on February 27th.